Who Stole My Religion? : Why this book? A dialogue on "Who Stole My Religion?" Why this book? A dialogue on "Who Stole My Religion?" Perhaps we can best explain our thinking about this book, why we wrote it, and what we hope to accomplish, through some questions and our individual responses. Schwartz: I decided to complete this book, along with Rabbi Yonassan Gershom’s superb help, because I feel that Judaism has gone off track in some important ways and that our planet has as well. Evidence is mounting that the world will experience an unprecedented catastrophe from climate change and other environmental threats and also very severe economic problems if major shifts in attitudes and policies do not soon occur. I believe that it is essential that there be open dialogues on where Judaism stands today and how its teachings can help address the many current threats. I believe that this book has the potential to break through some artificial boundaries and help resolve many difficult problems, reduce antisemitism, improve the security of Israel and, indeed, all the world’s people, and help move our imperiled planet to a sustainable path. If I did not believe this very strongly, I would not have decided that I must complete this book. Gershom: Richard and I have known each other for over 30 years, and have been dialoguing on these issues for at least a decade. We don’t always agree on how to approach the problems – I tend to be more confrontational than he is – but we both agree that Judaism has gotten off track lately. So when Richard asked me to collaborate on this book, I saw it as a great opportunity to put our heads together. We started with our many email dialogues as a springboard, then Richard, along with a lot of input from many other people, went on from there to write the book. What was the impetus that got you started writing this book? Schwartz: I have felt that “my religion has been stolen” for a long time. This feeling is renewed when I find Jews telling me that we need not be concerned about climate change or other environmental threats because God will take care of them or the Messiah will arrive and handle them; when members of my Modern Orthodox synagogue tell me that they are concerned only about Israel when voting, and they favor only the most hawkish Israeli politicians; when I attend a simchah (Jewish celebration) where meat is widely consumed and my wife and I are among the very few (if any) requesting a vegetarian meal; when I see so many women coming to synagogue wearing fur coats, unaware of the cruelty involved in producing them -- and much more that is discussed in the chapters of Who Stole My Religion. Because of many such experiences, I decided that, in spite of the opposition that I expect to receive, I must complete this book. Gershom: I've been thinking along the same lines for quite a while now. I have been a peace activist since the 1960s, and have become increasingly frustrated with the hawkish turn that the Jewish community has taken in recent decades. In my own books, I use popular culture and storytelling to address Jewish issues, because I am working primarily with outreach to alienated Jews and the general public. My 2009 work, Jewish Themes in Star Trek, for example, used that TV series to demonstrate a lot of basic principles in Jewish thought. But I have also written many articles, essays, and letters to the editor on political issues over the years, the best of which were collected into Eight Candles of Consciousness: Essays on Jewish Nonviolence in 2009. So this is not the first time I have discussed these issues in a Jewish context. My teaching methods are different, but Richard and I are on the same wavelength politically. Schwartz: Who is our intended audience? Jews who look to Judaism for moral and spiritual guidance, but who find that contemporary interpretations of our faith traditions do not address the pressing issues of today. Jews who are seeking a Judaism that will make a difference in responding to the crises of today and will help guide humanity in directions that can bring a more just, compassionate, peaceful, environmentally sustainable future for generations to come. Jews who recognize that the Jewish calling to be a "light unto the nations" gives them a special responsibility to live in ways that benefit all of God’s creation. Jews who believe that Jewish teachings can make a difference in responding to the crises of today; Jews who feel connections to Judaism but also feel that something is missing; Jews who are turned off by some of the realities in Jewish life today and would like to see positive changes; Jews who would like more of a dialogue as to Judaism’s future direction. And, since other religions have similar problems and concerns, I believe that many non-Jews will also find this book interesting, challenging, informative, and valuable. Several of the commendations (blurbs) presented for the book are from Christians and one is from a Muslim. Gershom: I think we are talking to Jews from a lot of different backgrounds, who might have these same questions in their hearts but are afraid to say it in public. You know, before I wrote my first book, Beyond the Ashes: Cases of Reincarnation from the Holocaust, there were both Jews and non-Jews who had past-life memories of dying in the concentration camps. Behind the scenes, both therapists and their clients were telling me about these cases. But nobody was willing to break the ice about it. Outside the Hasidic world, few people even knew that there are reincarnation teachings in Judaism. But after the Ashes book came out, it was suddenly OK to talk about it. I opened the floodgates. So maybe we are doing the same thing here – giving people permission to say, "You know, I've felt that way, too." If the emperor isn't wearing any clothes, maybe we need to be the ones to say so, even if we do look like fools. In the courts of earthly rulers, the fool is often the only one free to give honest feedback to the king. Is it proper to criticize Judaism at a time when Israel faces so many critical threats and antisemitism is increasing so rapidly? Gershom: Yes!!! Look at Tanach [the Hebrew scriptures] -- when the government went wrong, that is precisely when the prophets marched into the throne room and confronted the king. We aren't prophets, but they do set the example. If somebody is about to drive over a cliff, do you just sit in the passenger seat quietly and let you both die because you don't want to criticize his driving? Of course not! So yes, I think it is not only proper to criticize the current Jewish leadership, I think it is our duty as responsible Jews to do so. Back in the 1980s when I carried a sign with both a Palestinian and Israeli flag on it, I was blackballed as a traitor. Now the majority of Israelis support a Palestinian state, as do a lot of American Jews. Was I wrong to criticize back then? I don't think so. I think I was ahead of my time. As they say, "Walk three steps ahead and you're the leader. Walk ten steps ahead and you're a heretic." The moral principles do not change, but public opinion often does. My experience has been that a willingness to look honestly at a problem is respected, even by those who disagree. Group-think denial of a problem does not make it go away, and is not really respected by anybody. Group-think actually increases antisemitism, because people get the idea that all Jews think alike on every issue. Schwartz: Unfortunately, I do feel some loving criticism is called for today. “An open rebuke is better than hidden love” (Proverbs 27:5). It looks like Israel will face major threats and antisemitism will be a factor for some time, so it is not a matter of waiting perhaps a few years for a “proper time” to write the book. As the great sage Hillel said: “If not now, when?” After several unsuccessful starts due to the difficulty of challenging the Jewish community at such a difficult time, having Rabbi Gershom agree to work with me proved to be the factor that enabled me to continue and complete this book. I sincerely hope that our thoughts will help initiate respectful and open dialogues that will help revitalize Judaism, reduce antisemitism, improve Israel’s security and well-being and, in general, lead to a more just, compassionate, healthy, peaceful and environmentally sustainable world. Aren’t you picking and choosing the aspects of Judaism that you think should be stressed while ignoring other aspects of Judaism? Gershom: So nu, who doesn't do that? The Right picks and chooses, too. We are just offering a different menu. And I mean that literally. There are a lot of people citing the rodef verses ("If someone comes to kill you, kill him first" -- Kahanites love that one) but those same people have never even heard of the pacifist lines that are also in the Jewish tradition. As Ben Bag Bag says in Pirkei Avot, “Turn the Torah over and over, for everything is in it.” So yes, we are choosing to focus on different verses than our more hawkish brethren. Schwartz: I agree with Yonassan’s analysis, and I believe that the verses that we are stressing are those that reflect the true spirit of Judaism. Also, we are trying to start a respectful dialogue in the Jewish community on the issues that we are raising. Let those who disagree choose their quotations, and let the debate begin! Aren’t you basically limiting Judaism to aspects of tikkun olam (repairing the world)? Gershom: Not me. I also want to talk about God, about inner spirituality, about personal soul-searching, etc. The Haredi Jews might be ignoring tikkun olam (the mandate to heal the world), but the liberals are ignoring a lot of other mitzvoth (religious duties). Each side is like a bird with one wing, flopping around because it can't get off the ground. You need both wings (halachah and social action) equally balanced in order to fly. Schwartz: Yes, but I conceive of tikkun olam very broadly. In addition to trying to fix the world, we are also trying to properly transform Jewish education, synagogue services, simchas and other Jewish events, the celebration of Jewish festivals, and much more, to make all aspects of Jewish life reflect the tradition’s emphasis on compassion, sharing, justice, peace, and other positive values. Gershom: I am more of a traditionalist when it comes to synagogue services and rituals, but if you consider that, according to Hasidism and kabbalah, each mitzvah is tied into the spiritual fabric of the universe, then, in a sense, every mitzvah can be an act of tikkun olam. That was the original way in which Rabbi Isaac Luria (16th century) thought of tikkun. In many Hasidic prayer books you can still find meditations called tikkunim, to be said before carrying out a mitzvah, in order to focus the mind and heart on what you are doing. What is your main objective of this book? What do you hope to accomplish? Schwartz: In the face of today's urgent problems, I hope to help Jews return to our universal Jewish values and our mission: to be “a light unto the nations,” a kingdom of priests and a holy people, descendants of prophets, champions of social justice, eternal protesters against the present corrupt, unredeemed world, dissenters against destructive and unjust systems. I hope to convince Jews to become actively involved in working toward global survival and Jewish renewal, working for radical changes that will lead to a society where there is a major reduction in oppression, violence, hunger, environmental destruction, poverty, and alienation. 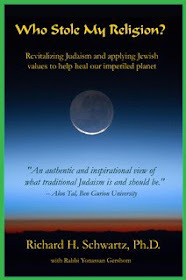 I hope our book will help revitalize Judaism and help shift our imperiled planet to a sustainable path. Gershom: Plus, we want to reclaim a part of the tradition that has been ignored in the last few decades. Richard and I are both senior citizens who grew up in a different era, and we feel we must pass down the Judaism we remember to the next generation or, heaven forbid, it will be lost. We are told in the midrash that Lot stood in the town square and preached to the people of Sodom even though they did not listen to him. Why? Because he understood that if he went silent, he became like one of them. So we must protest even if we think people are not listening. God listens and knows our hearts, even if our fellow Jews do not. Gershom: The religious Right for one thing -- and maybe the influence of Islamic fundamentalism in the Middle East. Don't laugh. The Mizrachis (Middle Eastern Jews) who came from Iran, Iraq, Morocco, etc. in 1948-50s were not the socialist liberals who founded Israel. They were Jews with a much more hardened attitude about a lot of things. They came from countries with a more restrictive point of view, without any Western liberalism. Not that they should not have come to Israel -- all Jews should be welcome – but they are the majority now and there has been a real shift to the Right, both politically and in terms of Haredi-style learning. And I think David Ben Gurion stole it from us, too -- by writing off all of the Diaspora experience as a mere "shadow existence" and flipping us back to the Biblical militarism that the Talmudic rabbis had done away with. Our sages had long ago transformed the historical battles in the Bible into moral lessons for our daily lives. So, for example, “Wipe out the Seven Canaanite nations” became wiping out the Seven Deadly sins in our hearts. There is a kabbalistic principle that, once something is elevated spiritually, you don't drag it back down again. War had been elevated from Assiyah (physical level) to Yetsirah-Briah (emotions-mind level) where it was about ethical struggles with the yetzer hara. Dragging it back down to political militarism has had disastrous results. Everyone is upset about Abu Gharaib because it was the Americans who did it, and it got widely publicized. But the Israeli Shin Bet guys have been doing things like that for years. Only we refused to believe the Palestinians, even though the reports from groups like Amnesty International were pretty consistent. In past centuries, Jews would never have used torture, which is forbidden by Jewish law. So is cutting down trees during the siege of a city, yet we know that Israelis have purposely cut down olive trees and grape vines in the Palestinian areas, in attempts to drive the people out. So we have to ask ourselves if Israel is really acting like a Jewish state should. We must confront its government today, the same as the prophets confronted their governments in the past. Schwartz: As a Modern Orthodox Jew who is proud of the many contributions the Orthodox community is making in terms of tzedakah (charity), acts of kindness, deep learning and much more (as discussed in more detail in chapter 1) I regret to say that the attitudes and actions prevalent in many Orthodox Jews are a major part of the problem. There seems to be a major gap between Judaism’s splendid teachings and the realities that I see in Jewish life today; Jews are generally failing to apply Jewish teachings to the many crises of today; many religious Jews have moved to the right and are supporting policies that are inconsistent with the historic Jewish emphasis on compassion, justice, and peace. Hence, there is a need to revitalize Judaism and bring many disaffected Jews back to participation in the Jewish community. All of this and more, which is that discussed in the chapters of this book, makes me feel very unhappy about many aspects of Jewish life today and that my religion has been stolen. This is bound to be a very controversial book. How will you deal with those in the Jewish community who attack your ideas? Gershom: Unfortunately we have already had to deal with some of that. A few of the advance readers were not very happy over our political stands on some issues, and at least one friendship went sour over what material we decided to include. But there were far more people who endorsed the book, and although they did not always agree with everything in it, they applauded Richard for having the courage to write it. Richard: To those who will attack the ideas in this book, I would like to say: Yonassan and I are not claiming that there is only one acceptable way to view Judaism and world conditions today. We are trying to seek common ground and solutions to current problems through respectful dialogues. To those who argue that all policies of the Israeli government should be supported for the sake of Jewish unity, please explain how Israel can avoid renewed conflict, effectively address her economic, environmental, and other domestic problems, and remain a Jewish and a democratic country if a comprehensive, sustainable resolution of the conflict with the Palestinians is not reached. For those who think that we are exaggerating about a potential climate catastrophe and think global warming is a liberal plot, please visit the website of Republicans for Environmental Protection (http://www.rep.org/). For those who are supporting the present Republican Party that has moved so far to the right under the influence of the Tea Party, please explain how their support of the wealthiest Americans and highly profitable corporations is consistent with Jewish teachings about compassion, sharing, and justice.